Light is the primary source of vision. When light incidents on any object, it gets reflected into our eye, then the sensation of vision takes place by human brain. 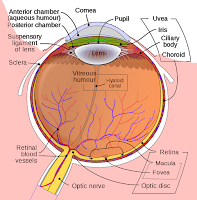 The light rays coming from the object forms image on our retina, it is inverted one. But, the brain makes us to see erected form. Q1. How do we see an object? Q2. What is the least distance of distinct vision? Q3. What is the angle of vision? Q4. When do we feel the object or the text, is not visible properly? Q5. How many types of defects are there? Q6. What is the construction of eye? Q7. Is there any lens present in our eye? Q8. Which is supposed as a screen in our eye? Q9. How the light rays get refracted into our eye? Q10. Explain clearly the defect arises with our age? Activity 1: Let us take a textbook, and make the book very close to our eyes, then think whether the text is visible properly or not. Move the book a little distance and observe the letters in book, then as the distance is increased the visibility is increased. The minimum distance where we can read the text clearly, is called 'the least distance of distinct vision'. It is approximately 25cm. This distance may be less in younger children. Activity 2: Imagine that an aeroplane is flying in air. How do we think the size of the aeroplane. It appears very small, as the distance from us is increased. The reason is that the angle made with our eye is very small, the angle made by the two rays coming from the aeroplane. In this way, we can understand that when the angle made with our eye is more than 60 degree, then we can't see an object completely. When this angle is smaller than 60 degee, then we can see completely. This angle is called angle of vision. Activity 3: The people who are unable to see the objects which are very nearer or who can see the distant objects is called the eye defect hypermetropia or hyperopia. In this case, the rays coming from nearer objects are focussed beyond the retina. To minimise this defect or eradicate it, we need a biconvex lens. The lens makes all the rays to concentrate on retina. Activity 4: The people who are unable to see the objects which are very distant or who can see nearer objects, then the defect is called myopia. In this case, the rays coming from the distant objects can be focussed before the retina. To correct it, we must use biconcave lens in our spectacles. The lens makes to focus on retina.